CVS pharmacy seems to have brought out the big guns this Halloween...or at least the two I've been in between Florida and Maryland. That's even where I found the Monster Poppers, and probably should have saved them for this post, in retrospect. Oh well, here's a couple videos and pictures of some other stuff! 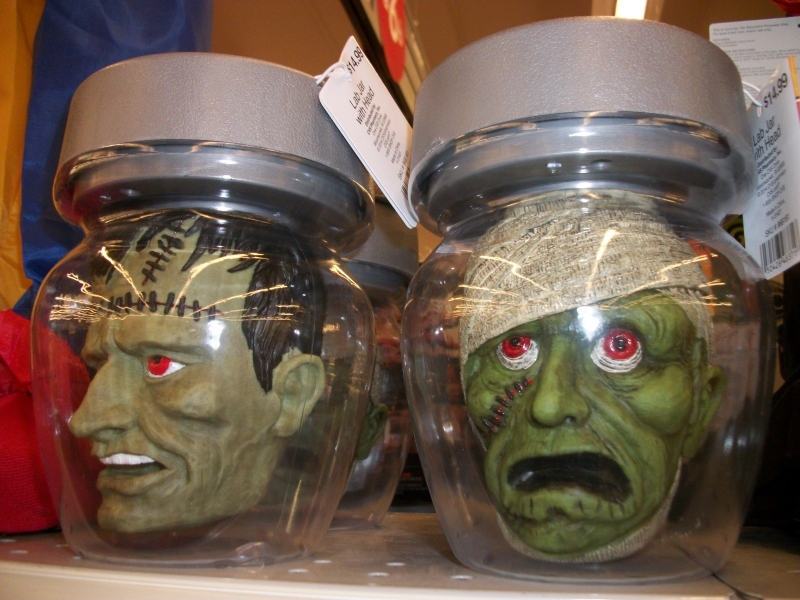 The prospect of a mummy head in a jar is pretty funny, and it doesn't look upset at being in a jar so much as aghast at what you've just done in front of it. What did you do? Pervert. The Frankenstein's Monster, on the other hand, doesn't really know what to think. He is both pleased and displeased. I don't know what noise they make because after a while I get a little embarrassed to be playing with these things in the middle of stores where employees probably have to hear them a thousand times a week. 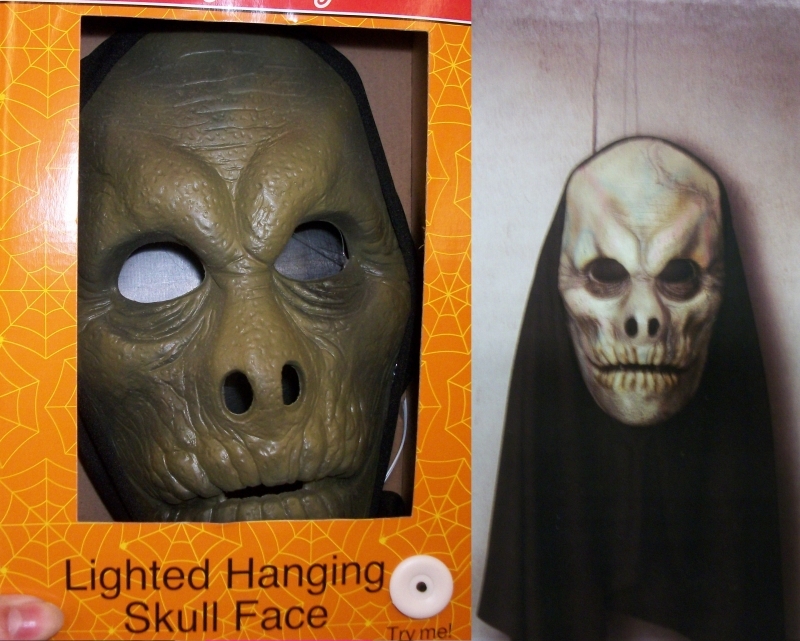 This is quite clearly not a "skull face." It's completely fleshed, and may or may not have ever been human. It's more like a mummified reptilian, and I'm sure the same mold has probably been used for a rubber mask a number of times, but I like it a lot better as just a wrinkly lizard-man's floating, severed head. We all know reptiloids form a shadow-government, but I'd wager the hovering faces of their dead ancestors puppet them behind the screens as a shadow-shadow government. Is there another layer of conspiracy beyond that? Probably. Probably hands or eyeballs or something. These could have easily been the chattering, light-up teeth alone, but the fact that they're suspended in a tasteful display bubble gives these a whole "evil laboratory specimen" or "haunted sideshow specimen" vibe. Simple, but wonderfully spooky. I just wish this were part of a whole line of similar items, like maybe some eyeballs that look around, or a pulsating heart, or of course, a brain. You don't know how long I've wanted a halloween decoration of just a brain creature in a tank that I wouldn't have to make myself. It's such fundamental spooky imagery and I still haven't found an example. How creepy is this? The ears don't make any anatomical sense, but the way it just kind of mournfully whines and howls, presumably because it is a confused skull without a body, it easily one of the more skin-crawling items I've come to possess over the years. I also enjoy how its action causes it to move around a little. On a smooth, flat surface it can probably scoot around fairly well, begging for treats it can't actually eat but will probably be happy to mash up with its fleshless bones anyway. That's the dog for me! As soon as I saw this, I already knew I would love it purely on the basis of being a big melting candle with a skull face on it, but it also dances and sings, and its song couldn't possibly be more delightful. Delightful...and chilling. Candle Skull threats to scare you with fright. I don't even know what that means. "Fright" is already involved in scaring someone, so going out of your way to specify it kind of indicates something darker. Something deeper. Could Singing Candle Skull wield the very power of pure, distilled fear itself? Is it going to show you what fear literally looks like? We've seen on Extreme Ghostbusters that that's actually really adorable.